Much like The Post (2017), Phantom Thread (2017) has a director/actor combination that just begs for an Oscar nomination. It seems that a decade after the last Paul Thomas Anderson/Daniel Day-Lewis collaboration, There Will Be Blood (2007), the Academy might want to pull their “should have won” trick and give the Best Picture Oscar to Phantom Thread. After seeing this film, though, I have changed my initial assessment. Sure, it’s good and has certain artistic elements that make it culturally significant, but other parts of it are just kind of . . . weird. First, the good. Daniel Day-Lewis, in his last role as an actor, unquestionably shows how good he is at his craft. I wouldn’t doubt that he has a good shot at earning his historic fourth Best Actor Oscar. The costume design and cinematography are noteworthy, but the best part of this film is a little more subtle: the music. The score for this movie permeates the entirety of it, but the fact that the majority of it is on stringed instruments (even the piano has strings) speaks to the “thread” connection. Quite clever, if you ask me. Overall, the film just seems to “work,” even if I don’t know how it does. Phantom Thread also seems to suffer from the same slow build-up that There Will Be Blood had. Sure, it’s methodical, but there are also weird moments where I couldn’t figure out what the characters were thinking. Sure, Day-Lewis’ character was a perfectionist to the detriment of his social skills, but some of his reactions were bizarre when the character broke out of his routines. Perhaps the weirdness of other Paul Thomas Anderson’s films (like The Master (2012)) leaked in and made it challenging to get a grasp on this movie. 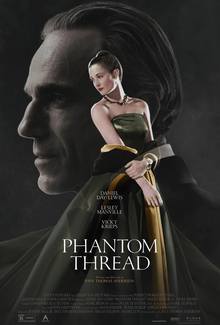 Another fine Paul Thomas Anderson/Daniel Day-Lewis film, I give Phantom Thread 3.5 stars out of 5.